Sometimes it's difficult to decide which colors to choose for a quilt, no matter whether we want to sew it in an orderly theme or make a scrap quilt. If that happens to you, find a multicolored fabric you love and let it inspire the fabrics you choose for quilt blocks. You love the colors in the fabric, right? So you will probably be just as happy with quilt blocks that are made from the same colors. 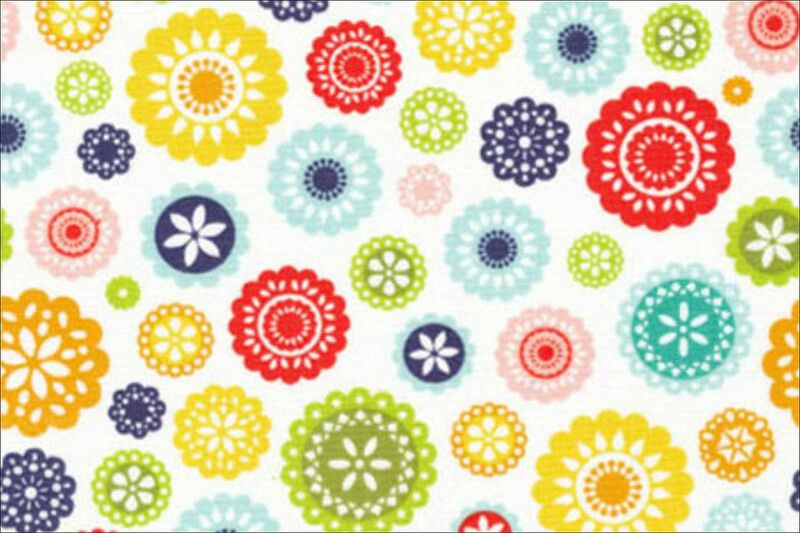 The inspiration fabric needn't be used in the quilt blocks, and whether or not to use it in the final quilt layout is up to you. If you do want to include the fabric in the quilt, try using it in a border, the backing, or in the quilt's binding. Use the fabric in any way you wish. Pinwheel quilt blocks are simple to make, and an easy project to test this method. Each pinwheel quilt block is assembled with four half-square triangle units that are dark on one side and light the other. The starting point for dark and light is up to you, but when selecting fabrics for a single block, it's important to choose colors that contrast with each other or you'll lose the pinwheel's spin. Try sewing with tone-on-tone fabrics or choose prints that 'read as' the color you're targeting when viewed from a distance. In other words, they may appear to be a solid color from a distance but a subtle print becomes visible when inspected more closely. There are many ways to make half square triangle units. Cutting and piecing individual triangles is the slowest and least accurate method. Quick piecing is a good choice because it helps you put these popular quilting units together quickly and accurately. We like to make half square triangle units from squares of fabric that are sewn together twice along their diagonal, then cut apart to yield two units. Cut two 4-7/8" dark squares and two 4-7/8" light squares. Follow my easy instructions to make four half-square triangle units from the squares. When complete, the units should measure 4-1/2" x 4-1/2". No matter which method we use, we nearly always begin with oversized squares, then trim the sewn units back to the correct size after assembly. The Magic 8 method is fast and easy and allows you to make eight identical units at once. Use the long grid method to make four half square triangle units. Your fabric strip should be 4-7/8" wide. Commercial products of all sorts are available, too. Arrange the completed 4-1/2" half square triangle units into two rows as shown above and join the units in each row. Press to set the seams. Press seam allowances towards the darker triangles. Sew the rows together, matching edges and midpoints carefully. Press the new seam allowance either direction. Check your block. It should measure 8-1/2" square. Sew with different square sizes to produce a variety of pinwheel block sizes; two light squares and two darks per block. Block sizes below are the finished sizes -- when you check the block for accuracy, it should measure 1/2" wider and taller than its finished size. The layout on this page illustrates one simple arrangement for pinwheel blocks, but the setting choices are endless.